The new heel trio of Joe Coffey, Mark Coffey & Wolfgang stood victorious against Mark Andrews, Flash Morgan Webster & Ashton Smith in a strong main event. Toni Storm beat Dakota Kai to establish herself for the upcoming NXT UK Women's title tournament in the best women's wrestling match on NXT UK thus far. We also saw the arrival of Jinny, who attacked Kai after the match was over. Zack Gibson defeated the debuting Amir Jordan and again drew a tremendous amount of heat in his post-match promo, setting up a match against Trent Seven down the line. Jordan Devlin once more looked impressive, beating another NXT UK debutant, Kenny Williams. This episode concludes the tapings in Cambridge from July 28 and 29 and we will move on to matches taped August 25 and 26 next week. Nigel McGuinness and Vic Joseph opened up the show, talking about the chaotic main event we would be getting tonight as a graphic of the participants in the match was shown. We also got a graphic announcing Toni Storm as the winner of the 2018 Mae Young Classic and a highlight video of her match against Io Shirai from Evolution. We were told Storm would be in action next. They brought up Storm's match against NXT Women's Champion Shayna Baszler at Royal Albert Hall and also mentioned that Storm actually had a victory over her in Japan. They started out with a headlock jockeying for position, but neither woman got the advantage. They shook hands, but both went for a kick immediately after, which both caught respectively and then proceeded to carefully set their opponents' leg down again. Kai took Storm down and hit a running kick, but Storm came back with strikes and a running kick of her own. Storm hit a nice snap suplex and applied a modified STF, wrapping her arm around Kai's neck in the process. Kai eventually reached the ropes for a clean break. Another striking battle was won by Kai and she hit a stiff head kick. A second kick was thwarted by Storm with a headbutt, but she couldn't capitalize on it, as Kai hit her with another head kick on a charge. Another kick attempt was caught by Storm, who hit a snap German suplex. Kai came back with a running kick into the corner but missed a second one. Storm went for her hip attack, but was hit by another kick. She managed to check the follow-up one and hit a beautiful release snap German suplex, followed by double knees into the corner and the Storm Zero (Air Raid neckbreaker) for the win. They shook hands and hugged afterwards. There also seems to be some confusion still about what move the Storm Zero is supposed to be, as the announcers called her Tiger Driver the same name before. On the indies, she usually uses a snap piledriver, which is being called the Strong Zero there, but obviously is banned in WWE. As Kai was on her way up the ramp with Storm still in the ring, Jinny came out and attacked her and called out Storm. Storm then helped Kai up and accompanied her to the back. Zack Gibson was shown backstage on his way to the ring, followed by a promo for the November NXT UK tapings in Liverpool. Jordan originally hails from Pakistan and started wrestling in 2015. He trained with Lance Storm at the Storm Wrestling Academy as well as the PROGRESS wrestling school. He's a regular in IPW:UK and 3 Count Wrestling, where he also was the North East Champion. Gibson tried for a double wristlock right away, but Jordan escaped and hit the big man from Liverpool. Gibson worked over his arm until Jordan escaped a wrist lock and proceeded to do his dance, mocking Gibson. The fans were fully behind him and hated Gibson with a passion. Jordan got a crossbody and a sunset flip, but Gibson just wouldn't go down and instead grabbed Jordan's arm for an arm ringer and hit a keylock driver for a near fall next. Jordan got a dropkick from the middle rope and even a high crossbody from the top, but it wasn't enough to put Gibson away. Gibson came back with a double palm strike and a stiff lariat followed by Helter Skelter. He locked in the Shankly Gates for the submission victory. After a Road to Evolution hype video, we were back in the ring with Gibson, who proceeded to cut another promo to thunderous boos and "Zack Gibson is a wanker" chants. His delivery was really good. Here is what he said verbatim: "I am Liverpool's number one; soon to be recognized as the world's number one; soon to be recognized as NXT UK's number one. I stand here once again victorious! I entered the UK Championship tournament and I won! I challenged the superstar of 205 Live, Noam Dar and I won! Every single day that I step into this ring is another step closer to becoming your NXT UK Champion. This brand, this movement, NXT UK is already the benchmark in British Wrestling. The very best talent from up and down this country flocked to NXT UK because they wanted to be part of something special. But they, the locker room, the punchers have another thing coming, if they think I'm going to share the top spot, I'm the guy to build this brand around. 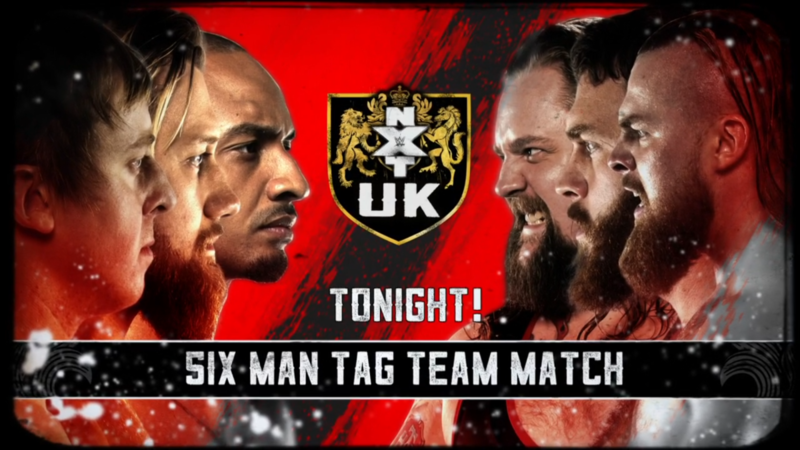 The NXT UK locker room is full of talent so ready to ride my coattails, I'm Liverpool's number one, I'm the man who's going to elevate this brand, not the Bruiserweight Pete Dunne, not Danny Burch, not Mark Andrews, not…"
At this point, Trent Seven came out to partake in the fun and said this: "Are you completely delusional? Seriously though, I have no idea what goes on in that shiny, sweaty head of yours, because I remember, not too long ago, in the Empress Ballroom in Blackpool it was those names and me that kicked this whole thing off in the start. Good point though, where were you? I didn't see you in any of the promotional material, I didn't see you on any of the social media, you were not in the back, did you buy a ticket to watch? No, you were sat upright in bed, with a nice cup of tea, with your mum's laptop, watching us make history on the WWE Network! Fair play, I gotta give you your dues, you were the 2018 UK tournament winner -- but you couldn't get the job done on night two, could you? However, you know what you did do that was pretty cool? You made every single person in the Royal Albert Hall take off their shoes!" This prompted another chant of "Shoes off, if you hate Gibson." Seven got into the ring at this point and continued: "Now you mentioned some very, very talented men earlier, but you failed to mention me. So how's about you and me right now in Cambridge, Gibson, let's go!" Gibson got into as fighting stance but then left the ring to another round of loud boos. McGuinness and Joseph talked about Jordan Devlin and we got a recap video of his debut match. This was followed by a Kenny Williams video, where he talked about being on 205 Live in the past and explaining why he was being called "The Luckian." Kenny Williams started in 2013 and is a regular with ICW, Defiant, Premier British Wrestling, and British Championship Wrestling, among others. He is the current Pro Wrestling Elite Champion and a three-time former ICW Zero-G Champion. He also teams with Noam Dar as the Champagne Superbollocks. He appeared on 205 Live from London back in May, competing in a four-way with Tyler Bate, Kalisto, and TJP. This was a fun match while it lasted and both men got to show off their talents. Devlin started with a wristlock and Williams hit a lucha-style arm drag off the ropes early on, which Devlin flipped through. Devlin hit his uranage/standing moonsault sequence and soon after put on a neck crank, which Williams countered out of with a chinbreaker. Williams got on the apron and they traded counters, then Devlin hit a hard forearm to the back of Williams' head, sending him to the outside. He tried for a running soccer kick on the apron, but Williams caught his foot and put Devlin face-first on the apron. Williams was back in the ring and hit a Wrecking Ball dropkick and a suicide dive on Devlin. Back in the ring, he followed that up with a flying back elbow off the top rope for a near fall. After a series of roll-ups and counters, Devlin finally hit the Island's Call for the victory. We saw Ashton Smith, Flash Morgan Webster, and Mark Andrews backstage, preparing for their match. There also was a graphic that there would be a huge announcement by Johnny Saint next week. Webster and Wolfgang started off, which made sense, as Wolfgang attacked him last week. Webster tried, but Wolfgang had the upper hand. Andrews and Joe Coffey tagged in next and Coffey took advantage of Andrews trying to go for a lucha-style DDT, holding on to his legs and spinning him around a few times before dropping him on his face. Mark Coffey tagged in next and Andrews flipped out of a back suplex attempt. Smith tagged in on the face side and hit some chops and a flying clothesline but only managed to get a one count. Everybody got in the ring at that point, but the referee had things under control again after a few seconds. Mark Coffey hit a big double fist blow and tagged in his brother, who knocked down Smith with a hard left. He also spun Smith around a few times, this time from a double underhook position, before hitting a nice butterfly suplex. Finally, Smith managed to hot tag Andrews as Wolfgang came in for the heels. Andrews, who beat Wolfgang last week, went for an enzuigiri and a hurricanrana off the middle rope. In a nice display of teamwork, Mark Coffey distracted Andrews, Wolfgang threw him out of the ring, and Joe Coffey attacked him at ringside. Andrews at this point was the face in peril and got worked over by all three opponents in quick succession -- until he finally managed to turn a suplex attempt by Mark Coffey into the Stunt Dog Millionaire and get to Webster for the hot tag while Coffey tagged Wolfgang. Webster cleaned house on the big guy, hit a jumping knee on Joe Coffey, and used a twisting moonsault from the second rope on Wolfgang for a near fall. Smith tagged in and hit a high knee in the corner, but his attempt to hit the Ashcloud DDT on Wolfgang was countered as the "Last King of Scotland" launched him into the air. Wolfgang tagged out again and both Coffey brothers were in, hitting a 3D variation with an uppercut instead of a cutter on Smith for another near fall. Smith hit a desperation superkick on Mark Coffey and managed to tag Andrews, who hit an enzuigiri on Joe Coffey but got caught on a moonsault attempt by Wolfgang, who had tagged back in. Andrews managed to turn it into a DDT and Wolfgang rolled to ringside. Andrews tagged Webster, and then he and Smith hit double suicide dives on the Coffeys. Back in the ring, Wolfgang decapitated Webster with a brutal lariat and tried to powerbomb him to the outside, but Webster managed to counter the attempt into a headscissors, sending Wolfgang to the outside again. Webster at that point hit a somersault senton onto everyone on the outside from the top rope. Back in the ring, the Coffeys pulled Smith and Andrews off the apron as Wolfgang hit a big spear on Webster, tagged in Joe Coffey, and whipped Webster into a spinning lariat by Coffey, which sealed the fate of the babyface team. The heels were being portrayed as an unstoppable unit here, so it remains to be seen who can step up to stop them down the line.